New research from the Association of Accounting Technicians (AAT), the UK’s leading qualification and membership body for accounting staff, shows that the bigger the business, the less likely it is for business owners to trust their employees to act ethically. Only 37 per cent of SMEs trust their staff to do the right thing compared to 66 per cent of microbusinesses. 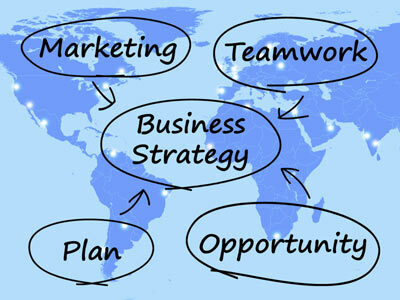 The research was conducted by Opinion Matters on behalf of AAT with owners of microbusinesses (companies of up to 9 employees) and owners of Small and Medium-sized Enterprises (SMEs) with 10 to 249 employees. Interestingly, the report also highlighted that as the number of employees increases, businesses are more likely to find a member of staff dedicated to ethical behaviour as well as having a formal code of conduct. 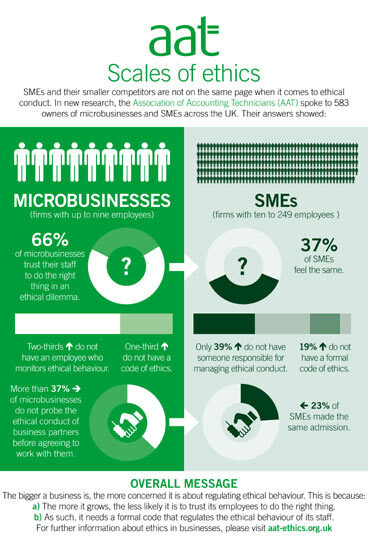 Nearly two thirds of microbusinesses do not have someone looking after ethical behaviour and one third of these types of businesses do not have a code of ethics. The scenario is different when we look at SMEs with only 19 per cent admitting to not having a business code of ethics and 39 per cent do not have someone responsible for looking after ethical conduct. When asked whether business owners consider the ethical behaviour of their suppliers before agreeing to work with them, more than 37 per cent of microbusinesses do not look into this aspect whereas only 23 per cent of SMEs do not take this into account. Director of the Institute of Business Ethics, Philippa Foster Back said: “Due to requirements of prime contractors higher up supply chains, smaller firms are increasingly asked during tendering processes about their ethical risk management. Commenting on the research, Adam Harper, Director of Professional Development of AAT said: “In the finance and accounting sector, we are well aware of the importance of ethics in business and the role it plays. New clients are likely to be drawn to work with organisations that demonstrate their integrity, so we take the view that ethical companies are sustainable companies.